Shorting a public stock is easy. Shorting a private company… well, not so much. If shorting was easy, here’s my take on why making a bet against WeWork’s $21 billion value makes sense. First, I have nothing against WeWork. I like the concept and much of what they do. I think they’re visionary and forward thinking about how we use office, and how it can be better. WeWork may be to office as Southwest Airlines is to the airline industry. Both employ creative methods to unlock value. WeWork does so with some of the best office real estate in the world as their construct. But as great as that may be, I really think they are wildly overvalued. And no matter how hard WeWork may try to avoid being analyzed as a real-estate venture, but rather as a “community company,” when you control 14 million square feet of office, I think analyzing the real estate play makes a lot of sense. This analysis began because my colleagues and I simply needed to find new office space. Without that need, this “unicorn” wouldn’t have caught my curiosity. For further color, I think it’s worth noting that I’m a surfer, skier, cyclist, frequent traveler and member of a few respected groups like EO and Summit. I’m a curious guy who makes a decent living and enjoys the aesthetics of living well. In a nutshell, I believe I’m the demographic and psychographic that WeWork seeks to “curate” into their community. As real estate guys, we have full access to CoStar, the lead office space listing service, or marketplace. We looked at everything in our market including sublets, small spaces, executive suites, and coworking set-ups. There were lots of options and plenty of competition. But what really became clear is that coworking really made sense for us. While paying ADT, Cox, San Diego Gas & Electric, and the janitor each month, as well as fixing items in the office as they failed (toilet, AC) wasn’t a huge burden, it was time and cognitive capacity placed into a 100% non-essential function that could otherwise be focused on revenue generating activity. The promise of coworking in this respect, plus the ability to scale up and downsize with almost no effort, was really attractive. So we looked. We saw few meaningful barriers to entry into coworking, and plenty of choices that serve as totally acceptable substitutes to WeWork’s design-led spaces. In San Diego, there are at least four credible competitors of some scale which can offer, as WeWork does, access to their full network of office locations with a membership. What we chose and why. offices at PBC were larger than WeWork’s. And, of course, the price was literally more than 50% below WeWork’s, even after we had negotiated a 15% discount at WeWork. What we see in WeWork. WeWork, to me, is where the hotel model meets office. They are making a bet that an operating company with professional management, a suite of value-adds, and branding can transform the old-school model of owning an office and paying leasing brokers to fill it up (after perennial tenant improvement expenses) into a robust cash flowing machine. 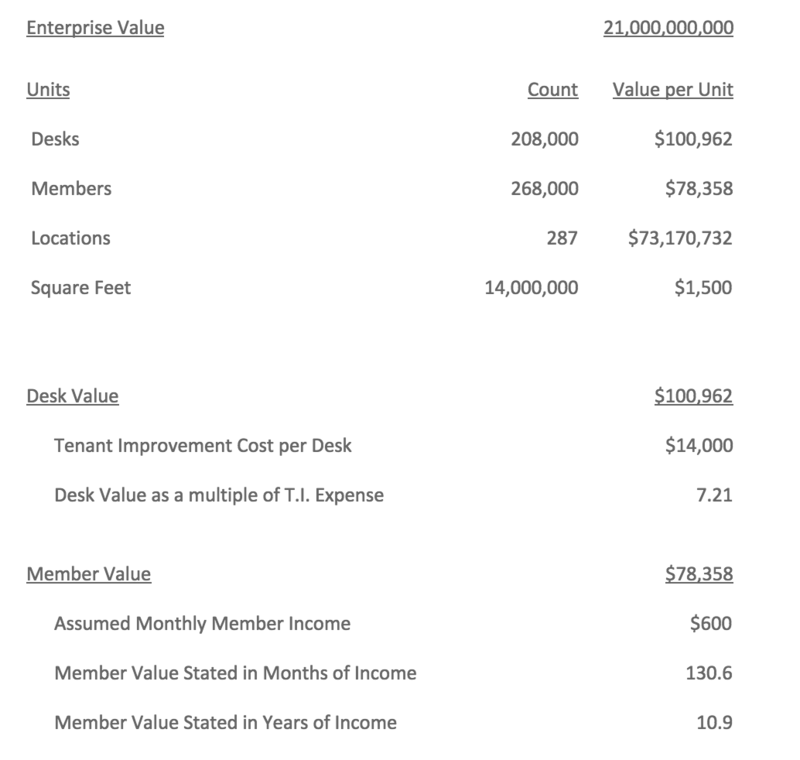 In one sense, WeWork is turning the office lease into what a hotel owner-operator might accept as a ground lease, knowing that their profit engine (high occupancy, high rates, and efficient operations to drive high NOI) is making a highly lucrative trade. WeWork, in some sense, is betting that they will see more latent value in office assets than all the other old guard owners do. I see a lot of innovation here and I think WeWork is bound to unlock a lot of value with their approach. But here’s the rub… how much value does it have? Is all that they’ve done worth $21 billion? Why that matters to investors in WeWork. At the time of my research, lease liability in London alone is 815 million pounds ($1.04 billion dollars), WeWork has become the largest tenant in the marketplace, just as Brexit comes to fruition. Across the entire WeWork platform, lease obligations are stated to be $18 billion. WeWork’s revenue from memberships more than doubled last year, to $822 million, but expenses also more than doubled, to $1.81 billion. Net losses came to $934 million, according to Bloomberg. All of these are pretty telling, but I’ll focus on the per-square-foot value of their lease holdings, which is $1,500 per SF. I don’t know the London and New York markets well, but I’m willing to bet that in the vast majority of the places that WeWork holds leases, this value per SF of leasehold space is a strong multiple of the value of those same square feet held on fee title. Since when is the tenant’s position more valuable than the landlord’s? The economic cycle, and its impact on office space, is real. It happens. WeWork can’t stand outside of that. They’re subject to the same pressures as landlords, but they don’t own the real estate and rather than seeing decreased earnings, they will face negative cash flow when short term tenants with no guarantees choose to move out. Market risk that always belongs to the landlord, who leverages his assets prudently for just this reality, are transferred squarely to WeWork. This lease arbitrage model works; paying the landlord $3 per SF rents and earning $11 per SF is bloody brilliant, but only until the music stops. When you’re small, and you’ve truly curated a workforce, you may be successful in recruiting an elite segment of the economy that is less susceptible to the downturns, and more resilient. However, when you’re the number 1, 2, or 3 tenant in some of the world’s largest cities, guess what? You are no longer curating; you are serving a huge segment of the entire market. You are the market. When the economy shifts against you, you are going to feel it. And remember, we just secured the substitute offering, which we deemed better, for 50% less than WeWork’s price. The tailwinds behind WeWork are not that significant. They don’t work under an entirely different economic model, and they can’t isolate themselves from the macro economic cycles, or the threat of substitutes. So… I’ve got some “spirituality” for you. If you’re an owner, get out while you can. And yes, if I could short WeWork, there’s no question that I’d make the bet.